On Saturday Erica Strader, an associate attorney in our Bend office, went to the Crook County Fair and Future Farmers of America/4-H auction in Prineville. 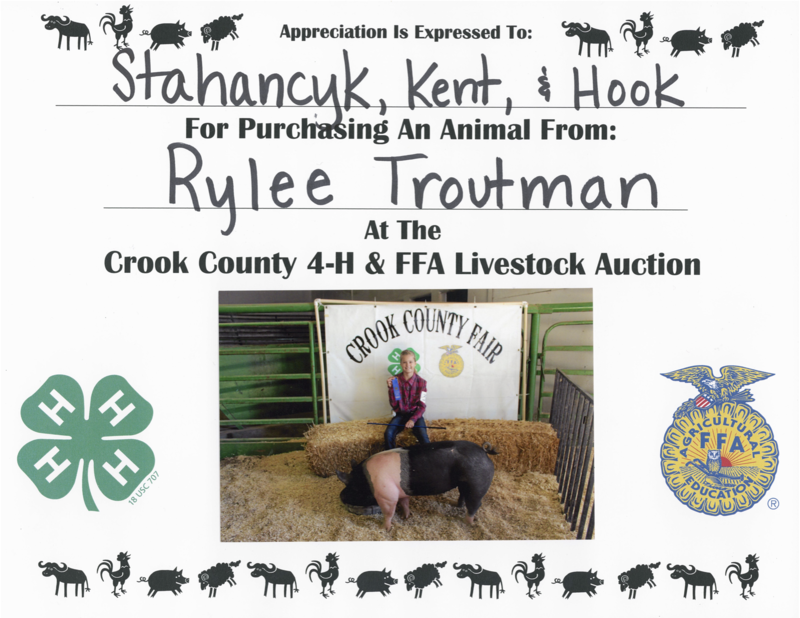 At the auction, she bought a hog raised by 7th grader Rylee Troutman and a steer raised by Ellen Ridenour on behalf of the firm. The FFA is a national organization devoted to assisting high school students who have an interest in agriculture to learn more about farming as a profession. 4-H is geared toward younger kids and is devoted to teaching them the basics of agriculture. During the spring and early summer, many 4-H and FFA kids raise animals to sell in the auction; every year the firm buys an animal or two to use in our kitchen.